Celebrating National Dog Day! - Children's Communication Center, Inc.
“National Puppy Day is a special day to celebrate the magic and unconditional love that puppies bring to our lives. But more importantly, it’s a day to help save orphaned puppies across the globe and educate the public about the horrors of puppy mills. National Puppy Day was founded in 2006 by Celebrity Pet & Home Lifestyle Expert and Author, Colleen Paige, who is also the founder of National Dog Day and National Cat Day (among many others).” Celebrated March 23rd! “National Dog Day celebrates all breeds, pure and mixed and serves to help galvanize the public to recognize the number of dogs that need to be rescued each year, either from public shelters, rescues and pure breed rescues. National Dog Day honors family dogs and dogs that work selflessly to save lives, keep us safe and bring comfort. Dogs put their lives on the line every day – for their law enforcement partner, for their blind companion, for the disabled, for our freedom and safety by detecting bombs and drugs and pulling victims of tragedy from wreckage.” Celebrated August 26th! This Center and our family currently share our lives with Sora, age 12, our yellow lab, Max, age 11, our Golden Retriever, and Grace Callie “Gracie”, age 6, our Whoodle (Soft Coated Wheaten/Poodle). All three joined our family from a rescue/humane society setting. Since arriving in Tallahassee in 1984, our family has adopted 7 dogs and shared our home with a total of eight. 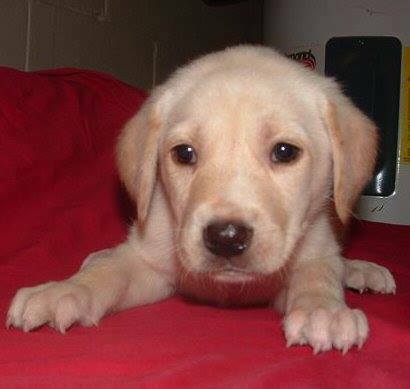 Sora, soon to be 12 years, is our wonderful yellow Labrador retriever. Who could resist that face? 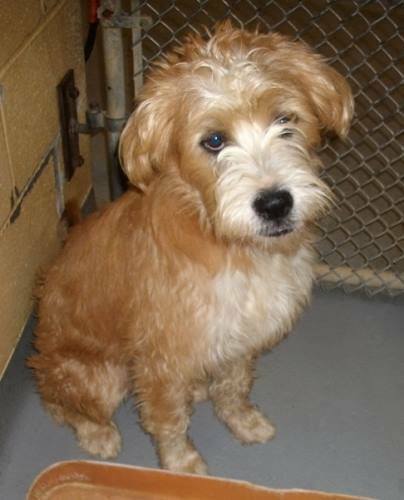 First seen online on the Bainbridge Humane Society page and pending a move to a Jacksonville Rescue. We called and asked them if we could visit him and drove to Bainbridge, Georgia right then. Happily, we were able to bring him home in that day in May 2006. Maximilian, named by the Henry County Humane Society, McDonough, Georgia is our Golden Retriever. Most of the time we call him Max! He joined Sora in April 2007 (after our sweet Sabrina crossed the rainbow) and they have been buddies ever since. Max is 11 but he continues to have his puppy face! Our Grace Callie, Gracie, was at the Wiregrass Humane Society in Dothan, Alabama when we saw her picture. Sadly, our Great Pyrenees/Golden Retriever, Abby, had crossed over the rainbow due to cancer at age two years. We did not set out to add another dog but when we saw “Alice”, we couldn’t resist the opportunity to visit her. Well you know how that goes, she promptly joined our family in Fall 2011. Information on registry for Service, Therapy, or Emotional Support pet. Learn about Animal Assisting Therapy Programs. Adding a pet to your family? PLEASE consider adoption, you will be glad you did! 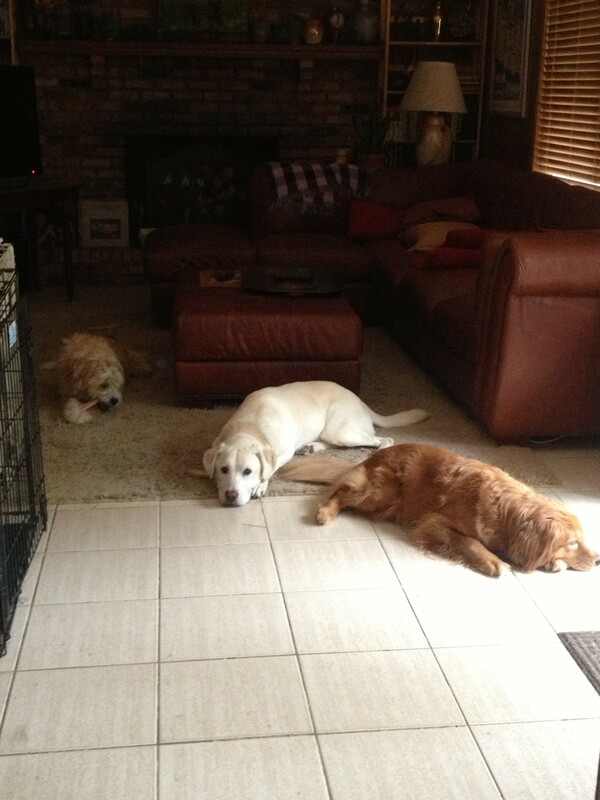 L to R: Gracie, Sora & Max are happily relaxing in the cool house during the blazing summer heat of July 2015! Max Teachers Story Telling: A day filled with excitement! Follow Sora, Max, and Gracie on their Barking Blog!